CLARKDALE, Mississippi (WTVD) -- Members of the Clarksdale Animal Rescue Effort and Shelter (CARES) in Mississippi are being called heroes after they saved a puppy's life. On Friday, CARES said they heard cries coming from a concrete storm drain. 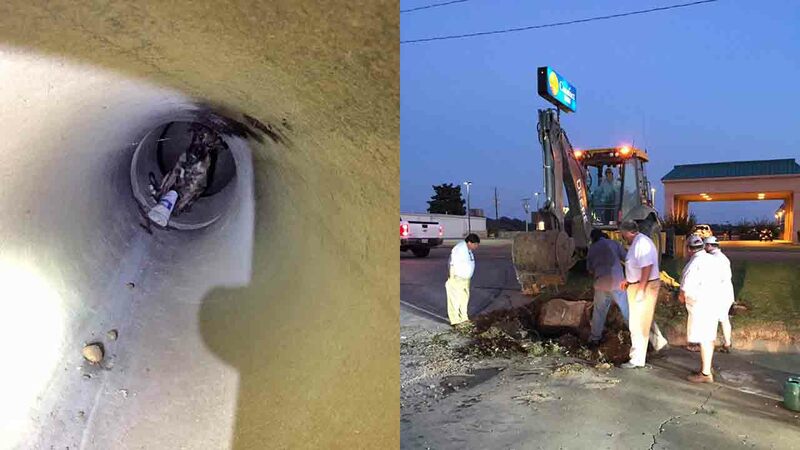 After investigating, they found that a young dog had fallen through a small opening and down four feet into a pipe. Because the dog was too small to climb back out, her only option was to wait for help or starve, the group posted to their Facebook page. Shelter officials said they called the city's animal control center, but when they didn't hear a response, they jumped into action! "So along with volunteers, we accepted the challenge of working to rescue her. Using time, brainpower, and heavy machinery, the top of the drain was finally removed, and one of our employees bravely climbed into the pipe (head first) to save her. Luckily, no pipes were damaged and no lives lost," their post said. Organizers said they're thankful that other businesses in the community lent a helping hand and the equipment needed to save the pup. Typically, CARES wouldn't have been so "hands-on" during a rescue, but they said they felt like that had no choice. "This is not a normal circumstance for us! We at CARES focus our manpower and resources on bettering the care of our animal shelter and maintaining our no-kill status while leaving the legalities and animal control to the City of Clarksdale. That being said - how thrilled we are for this puppy's future?" CARES named the puppy Piper and said she'll be up for adoption soon!